Distressed parquet and wooden floors are as popular as ever and seems to get more popular every week. 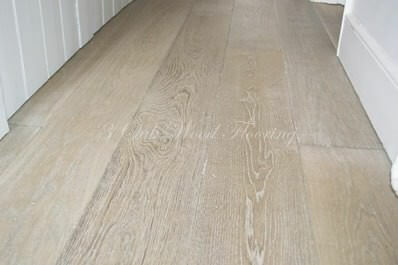 What is noticeable is that everyone now has distressed flooring in their ranges. This surely means that distressed flooring is no longer a mere trend, but is seen as an excellent way of giving your wood floor exclusivity and a little extra character. Why distressed floors? The great appreciation for old “vintage” items and in this case old floors, is demonstrated by the fact that "distressing" is now highly popular. Shouldn't we choose the real and authentic? The genuine and exclusive? Yes, we should, but what do you do if there isn’t any genuine reclaimed parquet available? Or our budget doesn’t stretch to 100 year old French parquet floor? There was a time when the sale of genuine, old (reclaimed) floors was booming business. Those old floors came from all sorts of places, castles, cloisters, school buildings, factories, and such like. They are recovered before the demolition or redevelopmen t of these buildings, and some traders specialised in the repair and re-sale of these floors. Old, reclaimed floors have one distinct advantage over new floors. It is impossible to perfectly imitate the patina. The look and feel of a decades old floor is unique in every example and impossible to replicate exactly. Manufacturing techniques have changed over the years too, all the idiosyncrasies of older handmade floors contribute to their unique character. 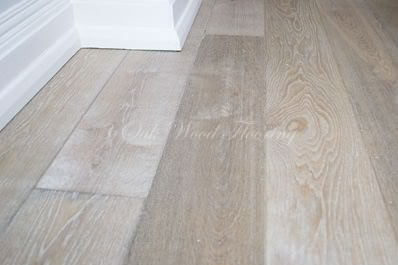 For example, anybody who manages to snap up a pre-1800 flooring will see that before 1800, wooden planks were hand sawn from the trunk giving unique look and feel. The other way of making a wooden or parquet floor from genuinely old wood is to produce new floorboards from old beams or planks. Over a century ago, wood was given a much longer and natural time to dry than today. After being used for a century, the wood has hardened and obtained its "weathered" look. By withstanding the ravages of time, the wood has proved its quality and durability. A good example and a very exclusive section of this market is the wood that comes from ship decks, the older the better (more expensive). Distressed floors are now a distinct section of the wood flooring industry. People generally appreciate a distressed look in wooden floors, even if they do not choose it for their own home, as proved by the fact that parquet manufacturers offer distressed floors in just about all shapes and sizes. They offer Solid and Engineered floors in "old patterns", which, when distressed, exude even more mojo. 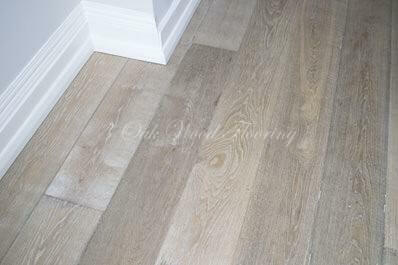 The fact that laminate makers are mimicking distressed oak floors is also a sign of the expansion of the market. There are several techniques used when hand distressing floors. We want to “damage” the wood by lashing, beating, brushing, scraping, and hand-scraping, some people use trays full of stones, rocks or nails that they rub or push parquet blocks into. Another way is to use hand tools like small hammers or screwdrivers to mark and dent boards or parquet blocks by eye in specific areas. Some people even go as far as drilling woodworm holes. This is usually combined with the other methods. Mechanical DistressingIf a lot of wood has to be distressed before further finishing takes place, a large tumbler can be used to roll the wood around with other abrasive materials, perhaps bolts, sand or gravel etc. This process quickly gives the wood a well-worn appearance. By making use of special colour oils, we can create the impression that new parquet is old. White and grey tints are extremely popular for this. White washed is proving extremely popular in this case the floor is brushed lightly first, if you then give the surface a white wash, you get a matt, slightly chalky floor. Extremely dark colours can also help to give the floor an antique appearance. Smoking wooden floors is one of the most popular and attractive distressing techniques. Smoking is a process in which a reaction is created with the tannin in the wood. 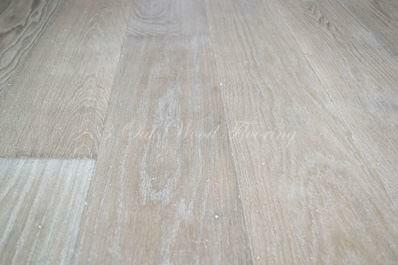 A lot of wood species have little or no tannin to induce a distressed colour. Oak does have enough tannin, especially European oak and American oak. Russian oak or Chinese oak has a lot less tannin and can be only lightly smoked at best.